A new rumor surfaced wherein it hinted that Nokia has been working on new flagship phone with dual cameras in the pipeline and may release it in June. However, to much of the surprise, the new device won't sport either the pure view or Carl Zeiss. 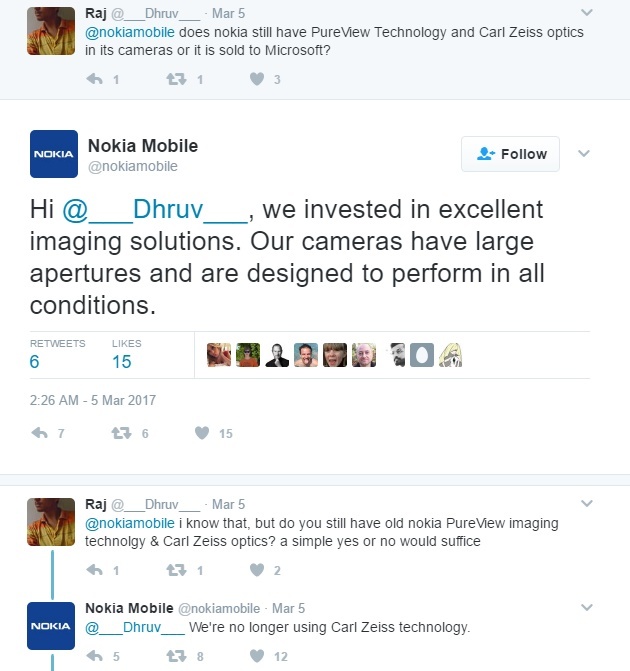 When Microsoft acquired to release phones under Nokia name it also purchased the PureView technology. So HMD does not have any rights to use the technology. Carl Zeiss has been the camera partner to Nokia for quite some time now. But now it seems the deal is done and dusted as confirmed by Nokia through its official twitter handle. But they did not attach any reason to the response. But they said that they have invested in the "excellent imaging solutions". Apart from the dual-cameras, the flagship is said to sport all-metal design, this makes the build of the phone stronger. The flagship is said to be powered by Snapdragon 835 processor and according to the source, the new flagship will be different from the other flagship phone with Snapdragon 835 SoC that is scheduled to be released later this year. Leaving apart the cameras, both the devices will differ with regard to RAM (4GB/6GB), Screen size and pricing. Both devices are said to be priced above ¥4000 (~$580) and the larger variant may even be priced at over ¥4500 (~$652).